The presence of all good will take the place of the absence of all evil. And in the foreground of this picture of glory we place the full, unclouded vision of Jesus. This is the Sun that will bathe all other objects in its beams. We see Him now through faith’s telescope, and how lovely does He appear! Distant and dim as is the vision, yet so overpowering is its brightness, as for a moment to eclipse every other object. How near He is brought to us, and how close we feel to Him! Encircled and absorbed by His presence, all other beings seem an intrusion, and all other joys an impertinence. Reposing upon His bosom, how sweetly sounds His voice, and how winning His language: “O my dove, that are in the clefts of the rock, in the secret places of the stairs, let me see your countenance, let me hear your voice; for sweet is your voice, and your countenance is lovely.” These are happy moments. But how transient, and how brief their stay! Some earthly vapor floats athwart our glass, and the bright and blissful vision is gone—veiled in clouds, it has disappeared from our view! But not lost is that vision; not withdrawn is that object. As stars that hide themselves awhile, then appear again in brighter, richer luster, so will return each view we have had of Christ. The eye that has once caught a view of the Savior shall never lose sight of Him forever. Long and dreary nights may intervene; the vision may tarry as though it would never come again, yet those nights shall pass away, that vision shall return, and “we shall see Him as He is.” And if the distant and fitful glimpses of the glorified Christ are now so ravishing, what will the ecstatic and overpowering effect of the full unclouded vision be, when we shall see Him face to face? 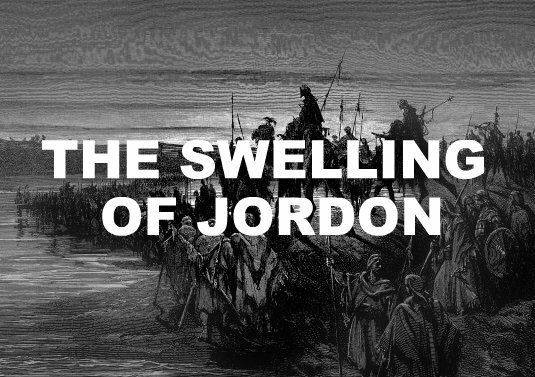 “The swelling of Jordan”—words of solemn import, calculated to convey to the believing mind a gloomy idea of death. That there are swellings of Jordan in the Christian’s experience we doubt not. For example, there are the fears with which the child of God anticipates the last enemy—there are the sad recollections of all his past sins crowding around his pillow—there are the suggestions of unbelief, perhaps more numerous and powerful at this moment than ever—and there is the shrinking of nature from the final wrench, the last conflict, the closing scene—the last glance of earth, the last look of love, the loosing of those fond and tender ties which entwine us so closely with those we leave—these are some of the swellings of Jordan.